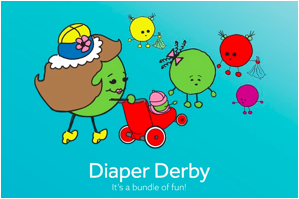 The Shops at Montebello invites the area’s cutest babies to crawl their way to victory at its first-annual Diaper Derby on Saturday, June 28, from noon to 1:30 p.m. in Center Court. The event is a series of crawling races on a soft, sanitized surface, and is open to all babies less than 12 months old who are not yet walking. Proud family members and friends are invited to cheer on the babies in each of the three heats of six babies each. The top crawler from each of the three races will compete for prizes in the final race. The fastest crawler will receive a 1st place prize of a $100 gift card to Children’s Place, the 2nd place racer will win a $75 gift card to Gymboree and 3rd place will earn a $50 gift card to Baby GAP. Parents will try to motivate their children at the finish line, using various attempts to get their child across the line first. This commonly includes the playing of instruments, holding a child's favorite toy or teddy bear, and generally encouraging them along the way. Mundo FOX Channel 22 entertainment reporter Melissa Martinez Romero is slated to emcee all the action. Registration and participation in the event is free. To register, families can visit The Shops at Montebello’s Guest Services booth, located on the lower level near Macy's Home. A maximum of 18 participants will be registered for the event, and all registered participants will receive a special gift from The Shops at Montebello on the day of the event, during the time of check in. Other enjoyable activities will include retailer stations, special offers, giveaways, prizes, and lots of fun for the whole family.